Everyone loves fire trucks and the museum now has a very special one. 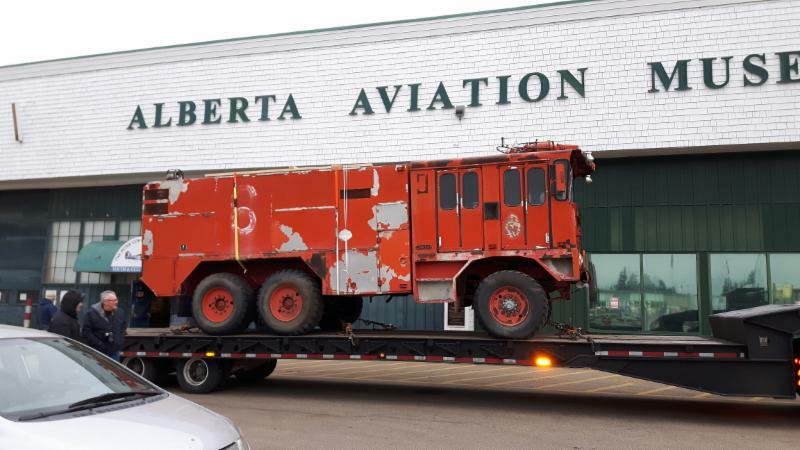 It’s a Sicard Pyrene airport crash truck that was based at CFB Namao during the mid-1960s. The truck was donated by Doug MacKenzie, of High River, Alberta. It is historically significant because it bears serial number "One." That restoration never got underway. Recently, MacKenzie decided to donate one of the vehicles to our museum and the other one to the Reynolds Alberta Museum in Wetaskiwin. Our fire truck has a Pyrene, Rolls Royce-powered foam pumping system mounted on a Sicard chassis. It has six-wheel drive powered by a Waukesha V-8. The vehicle is parked behind the museum. Look for it to be on for display during special events. Our thanks to Doug MacKenzie for the donation. 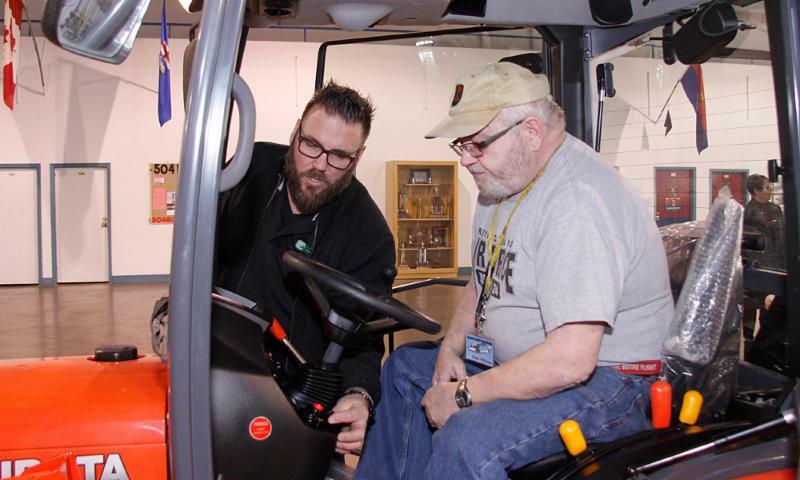 The Alberta Aviation Museum is all about vintage flying machines, but to keep our operations running smoothly, we needed to modernize our fleet of aging trucks, snow plows and other heavy equipment. 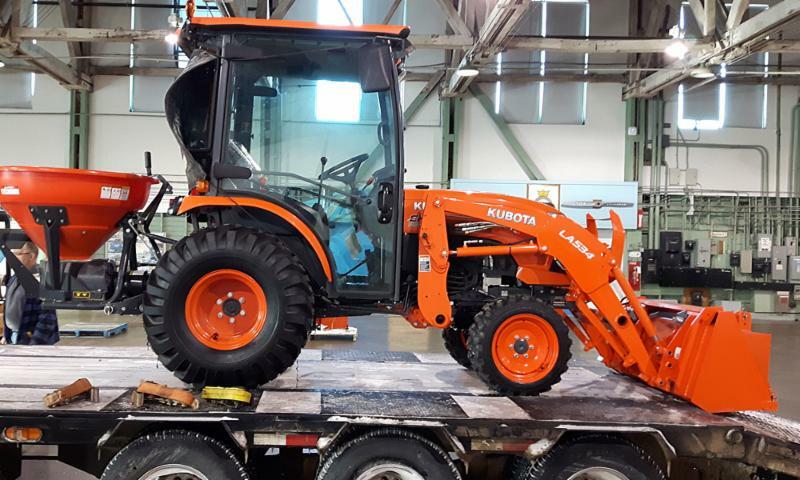 Our new Kubota tractor is a major step towards that goal. Equipped with a bucket, sander, broom and snowblower, it will be the backbone of our maintenance operations. It has come in handy dealing with the recent snow and ice, allowing us to keep the museum safe for the public. Thanks to Corey Nelson, of Edmonton Kobota (seen at left, briefing our Dana Williams) for helping complete the deal. In the next months, the museum will be replacing or upgrading all its heavy equipment to make sure we can maintain our hangar to the standards our visitors expect. AAM followers now have a new way to get their aviation history fix. In addition to being on Facebook and Twitter, we have added Instragram to our social media offering. "Instagram will allow the museum to connect with the next generation of aviation enthusiasts," says Zena Conlin, coordinator of marketing and sales. "We’ll share fun photos, interesting tidbits, and quirky facts. It’s an exciting new way to interact with the museum, our collections and our staff." 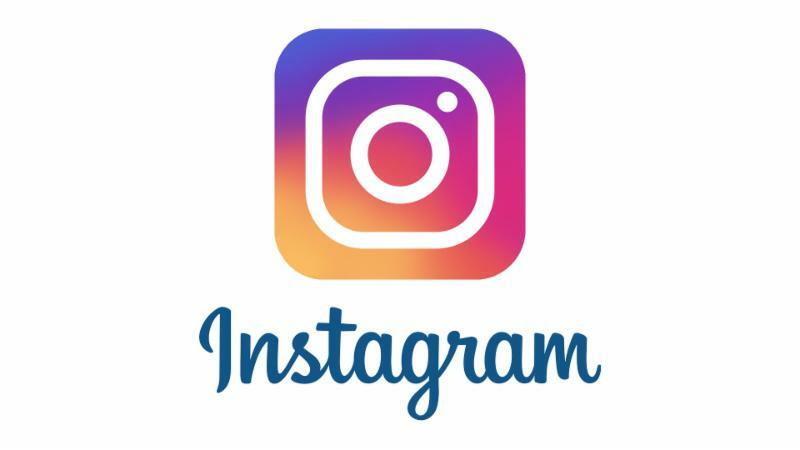 You can find our Instragram feed here. And be sure to stay tuned for another big announcement regarding the Alberta Aviation Museum's online activities. 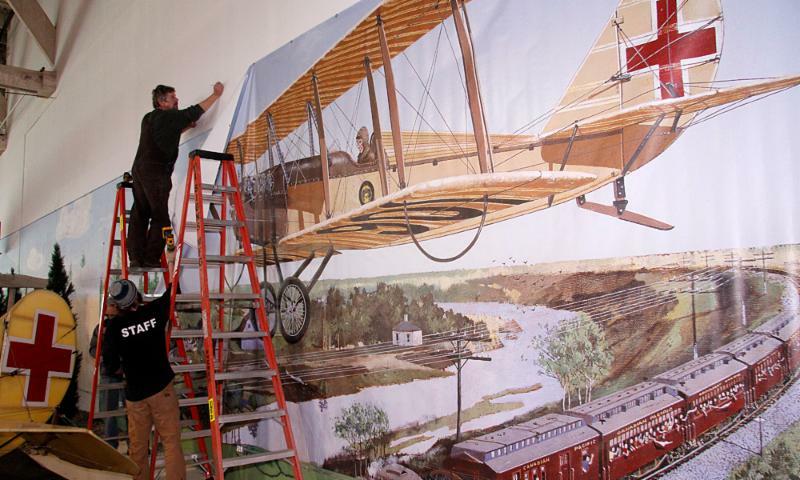 Workers from Hi Signs hang the first in a series of giant banners that will serve as backdrops to our new aircraft displays. More banners are on order and will be rolled out in the coming weeks. 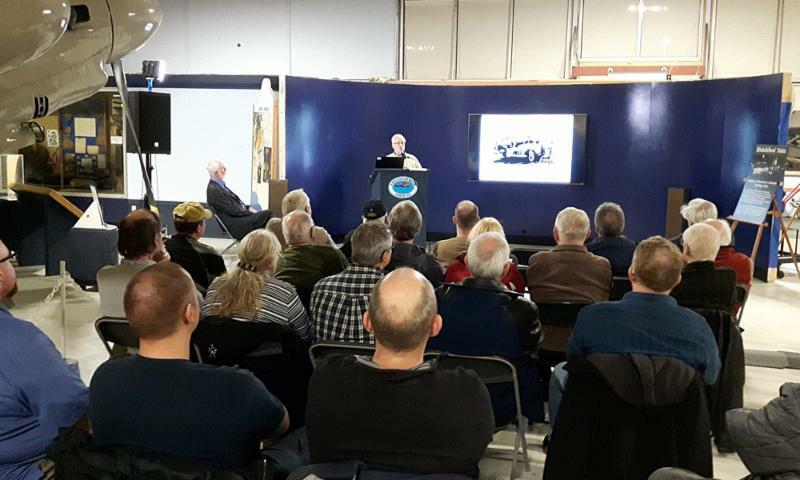 Historian Ken Tingley delivers his Jan. 19 lecture, Red Stars over Alberta, telling the story of the Northwest Staging Route. Watch for a written version in an upcoming issue of the historical newsletter, " In Formation." February 16, 7 pm. Back to the Future: Airships Then and Now. Part of the AAM Lecture Series. 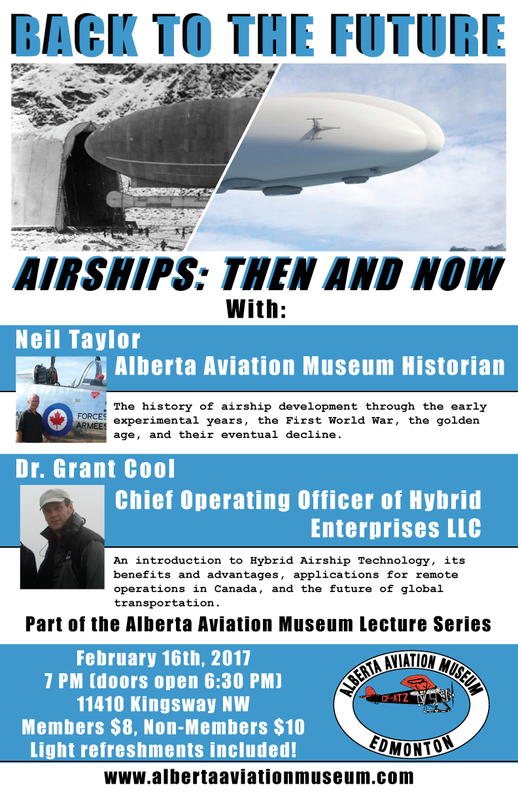 Museum historian and In Formation editor Neil Taylor and Grant Cool, CEO of Hybrid Enterprises LLC, talk about the history of airships and the renewed interest in the massive flying machines. Members $8, non-members $10. More details here. March 11, 10 am – 4 pm. Women of Aviation Worldwide Week. Activities, lectures and displays recognizing the past and current contributions of women in aviation created to engage and inspire the next generation of women aviators. Details coming soon!